Chief Warrant Officer 5 Kevin P. Dares was appointed the Command Chief Warrant Officer for the Louisiana Army National Guard by Major General Glenn Curtis as Louisiana’s 7th State Command Chief Warrant Officer on 1 October 2013. 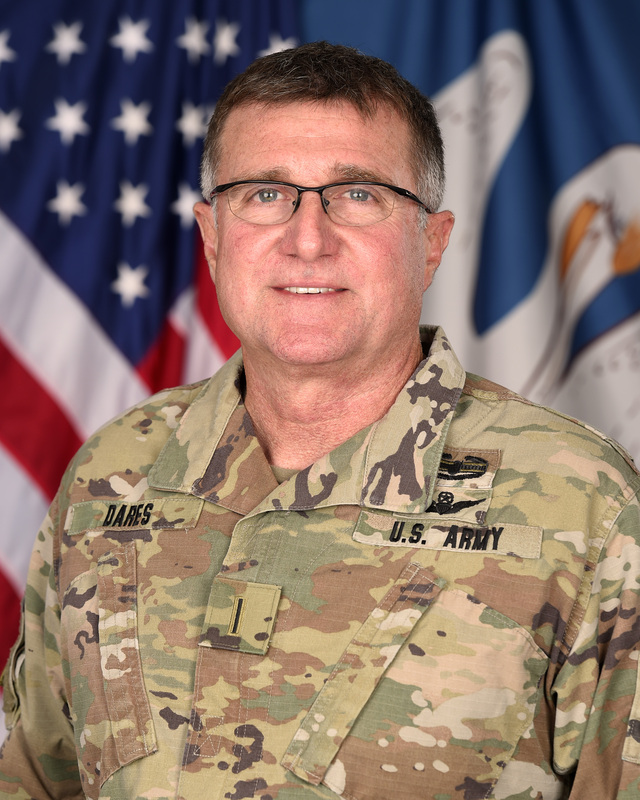 As the Command Chief, he serves as the senior warrant officer advisor to the Adjutant General to address the development and strength management of the Warrant Officer Corps. CW5 Dares is responsible for keeping the Adjutant General informed and making recommendations in matters of recruiting, morale, welfare, schooling, promotion and retention. Prior to his appointment, CW5 Dares served as the Commander of OSA SFD 38 under the State Aviation Command in Hammond, Louisiana. CW5 Dares is a native of Metairie, Louisiana where he graduated from Archbishop Rummel High School 1978 and from Nicholls State University in 1982. He enlisted in the Louisiana Army National Guard in 1984 as a helicopter mechanic and in 1986 he began Army flight school training. He was commissioned as a Warrant Officer One in 1987. Upon completion of flight school CW5 Dares was assigned to the 1-244th AHB where he performed duties as a Standardization Instructor Pilot until 2003. During this time he flew UH-1H/V and UH-60 helicopters. From 2003 until 2008 CW5 Dares was assigned to the State Aviation Command where he oversaw pilot training and standardization for all aviation units in Louisiana. In 2008 CW5 Dares was assigned as Commander of OSA SFD 38 which flies C-12 fixed wing aircraft to conduct troop transport within the Continental United States, Caribbean and Central America. From 2003 through 2005, CW5 Dares mobilized and deployed as the Standardization Pilot with the 1-244th Assault Helicopter Battalion to Balad, Iraq. In 2005 CW5 Dares was mobilized for Hurricane Katrina and was responsible for establishing a helicopter evacuation zone at the Morial Convention Center in which an estimated 10,000 citizens were evacuated by air. From 2008 through 2009 CW5 Dares deployed as the C-12 Commander to Djibouti, Africa where his unit flew missions throughout the Horn of Africa and Southeast Asia. CW5 Dares has completed the Warrant Senior Staff Course, the UH-1, UH-60 and C-12 Instructor Pilot courses and the Instrument Flight Examiner course. He has compiled over 7300 flight hours. CW5 Dares resides in Folsom, Louisiana with his wife Dawn Farrar Dares. They are the parents of four children, Kevin II, Jessica, Amy and Michael and grandparents of Victoria and Skylar.